What is the Achtung Die Kurve lab? The Achtung Die Kurve does research to things in Achtung Die Kurve. We search for all kind of statisctics in Achtung Die Kurve. For example we can find out how much holes you get in 1 second or how long a power-up lasts. Every statistic we found in Achtung Die Kurve will be post in this topic. So in this topic will be a lot of helpfull information about Achtung Die Kurve. Viigoo and I are looking for things we can research. So do you have a good question for the Achtung Die Kurve lab? You can post it here. How long does it lasts to turn 180 degrees? And with power-ups? It takes 1,25 seconds to turn 180 degrees. It takes 1,75 seconds to turn 180 degrees with the green turtle power-up. It takes 0,75 seconds to turn 180 degrees with the green speed power-up. It takes 0,75 seconds to turn 180 degrees with the red speed power-up. It takes 2,50 seconds to turn 180 degrees with th red turtle power-up. We did a test of the frequency of making a gap/hole. The total holes we did make is 915. We made them in 1952 seconds. So you get an average of 0,46875 holes per second. That's almost one hole in 2 seconds. We think it's programmed to 0,5 holes per second. How big is the chance that you go through a line with just making a lucky hole? One thing is sure: You can't go through a line when your head and the line make an angle less than 30 degrees. We tried 317 times to go through a line with an angle of 90 degrees. We failed 296 times and we had 21 times succes. That means that you have chance of 6,62 % to go through a line with making a lucky hole in an angle of 90 degrees. One month ago I did another experiment with help from ADKPro. We wanted to find out what determines the winner of a point if both players die at the exact same time. So we made a scaled room and at the start of every round both players went outside the screen before the lines settled. At the beginning we thought it was random who would win the point, but the result was 10-0 for me. We then changed colors and then ADKPro won 10-0. So we came with the hypothesis that the winner is determined by the colors. This means that some colors are better than others. We then tested it with every color and got these results. How many seconds takes it to turn a half circle? And with green PU and red PU? It takes 0,75 seconds to turn 180 degrees with the green turtle power-up. It takes 1,75 seconds to turn 180 degrees with the green speed power-up. Hmm you corrected me wrong, because you're faster when you have a speed power-up. How I did find it out? I just made a simple circle and I timed how long it takes to make one. And then I devided it by 2. With the power-ups I just picked a big hole power-up. Then I picked up the turtle power-up and I timed how long it takes to make a circle. Btw I did this many times so I think this is secure enough. And what with basis powerups? Orange is squeezed to the wall, but tries to be lucky by going through the blue line. The probablility of orange making a hole at the right time is as you said, 6.62 %. But there is also a chance that blue makes a hole at the exact time when orange goes through. I estimate that this is also 6.62 %, so the probability of orange going through is actually 13.24 %! In a real game situation you will probably not hit exactly 90 degrees on your opponents line, so the chance is a bit lower, but it's still suprisingly high. We did the experiment in team mode to not loose rank (this was before team ranking was implemented in the game). Afterwards we found that it was different results in FFA, so our results only applies to team games. The conclusion was that in team games dark blue and light green are the best colors because they beat most colors. The results also shows that team coool is better than team hot. In fact, all the colors of team coool beats all the colors of team hot when dieing at the exact same time. Thank you very much for your support and involvement Alfy! Unfortunately Quixy is off for few days and I'm unable to make some of the researches mentioned by you. 2) I'm 99.99% sure that certain power ups have different spawning chance. And you are right 10 tries is not a relieable source of information, but it was just opening information and the base for further analysis. I am making statistics in Libre Office (something like Excel, if you've not heard of it before). Why is that? It allows me to update results and add more statistics, parameters, formula etc. without disturbing previous results... moreover, adding results will just increase the accurracy of our researches, and limit the risk of any kind of mistake. 3) I made with Quixy similiar experiment with connected with duration of certain powerups, and we ALMOST agree with you in 100% :P, in our research we've noted that fat power up lasts 7 seconds, not 8. But don't worry we'll make additional tests to ensure that there was no mistake. 4) I'm shocked with this experiment with winner of a point if both players die at exact time! I thought about it before, but I suspected that the one who is closest to the battlefield wins, anyway we'll surely examine this problem soon! Im back of my holiday. Alfy, wow I didnt know that the cool team is in the advantage with team. I don't think the hole frequency change when you're fat. It looks like you get more holes, but that is because the holes are much bigger. And thank you for the ideas, we definitely will pick some ideas and work them out. And everybody feel free to ask question and help with the research. Did someone had a peek in the source code?! Nice thread guys. I just verified some numbers and in general it looks pretty ok.
Whate determines the winner of a "kiss" (two or more players kill each other)? Oh yeah I understand what you mean. If I'm turning away from the other players line while 'kissing' I win most of the times. With the new update it will be much easier to test things, so, who does have a question? 1. Is the frequency (distance; maybe in % of the playing field) of holes normally distributed? AND when you are fat . You make a faster turn . Is this true? I thought it only seemed that way, the radius is the same I thought. No . I think it is true . You make a smaller circle. Same radius, but if you're fatter, it looks like your radius is smaller. With one fat they are 4mm. So, the number of fat powerups you have to take to get a curve bigger then the EARTH on my screen is: 33! do you think this is right, Fire? Because if I use a smaller screen (lower resolution) my line will be smaller causing me to have to pick up more fat PU to get to the same result. Well, it would only change for 1 or 2 PU I guess.. This thread hasn't been updated for a long time, because Viigoo is in the exam year. I would like to know how the chances are to jump over a wall when you are fat. As I experienced that often it works, as when you are fat you create bigger holes. This is true that I have some work with exams nowadays, but I actually miss some of our research. I suggest to continue and reopen our lab. Just let me know Quixy if you have time soon. What's up? When will the reopening be? No one, as far as I know. He was quite good, as far as I know. I know it's been a long while since this thread has been started, but are you guys able to measure this thing again including colors: white, purple and rainbow? I would it very much. The Maker of Beer has joined the game! Looks like he hasn't quit at all ... Mabe I should PM him? And quite a noob now ... ;-) I'll PM him. is this still correct? because i once tested it and there dark blue loses always vs yellow, but also lose vs light green, so he would win 5 and not 6?! 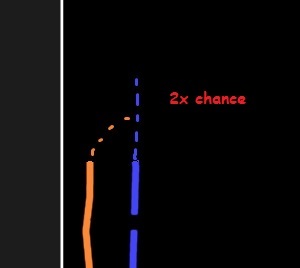 what is the normal speed of a line going straight in pixels/second? Indeed, what about white, purple, rasta and rainbow? I've always thought that if two or more people die, that it'll be alphabetically chosen. Like in an FFA battle, when two or more people have the same amount of points. By the way, how about lime and blue? They both beat six colours, but will blue or lime win? My friend, Yubi Nashi & I decided to improve the Research Lab where possible. We saw the post about the difference in colors; that some colors would be better than others. So we decided to redo the whole test and include the new colors like white, purple, rasta & rainbow. We wanted to find out what determines the winner of a point if both players die at the exact same time. So we made a scaled room and at the start of every round both players went outside the screen before the lines settled. First we tested red against all other colors and red always ended up losing. After that we did the same for orange and got the same results, orange always ended up losing. We thought something was wrong and decided to make a new room. This time my friend, Yubi Nashi was host (previously I was). Again we tested both colors against all other colors and this time red and orange won every time. Conclusion: The host gets the least amount of points when multiple players die outside the playing field. After that, we checked if there would be a difference between the team the color is in. For example, rainbow can be in hot as well as in cooI. Conclusion: Team cooI gets the highest amount of points when multiple players die outside the playing field. Later we realised guests can also play unranked team games when they get added by a player. We tried it out as well and got interesting results. Conclusion: Guests get the highest amount of points when multiple players die outside the playing field. We also noticed there is no difference between non-premium players & premium players. Conclusion: There is no difference between non-premium players & premium players when multiple players die outside the playing field. We did not get any logical or re-occuring results between colours when we mixed up guests, host & team. Conclustion: We did not get any logical or re-occuring results between colours when we mixed up guests, host & team. We think the color itself doesn't matter, but we cannot prove it. We then put all those conclusions together to see which variables have the greatest impact. 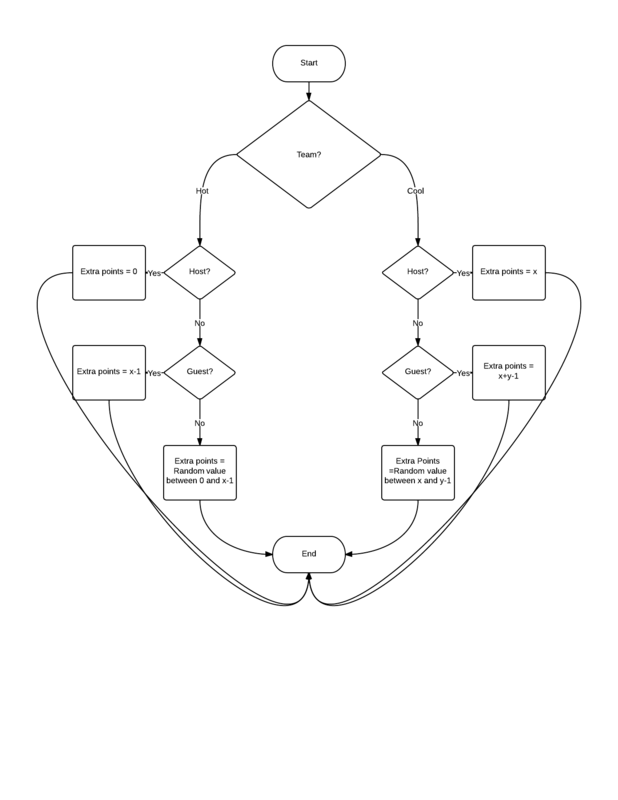 Conclusion: We know the flowchart of the source code looks something like this. We think that when multiple players die at the same time outside the playing field, it doesn't matter which color you are, but we cannot prove it. The team the player is on has the greatest impact on the amount of points he will get. Every player of team cooI gets more points than every player of team hot. The host will get the least amount of points of his team. The guest(s) will get the most amount of points of his team. This is only for team. We did not test FFA.